My wife, Marci, and I have just returned from such a wonderful lunch that I simply had to sit down right away to tell all of you about it. Now, you have to understand that we’ve eaten more than half our meals at restaurants for many years now. We both love to cook, but our busy schedules don’t always allow us that luxury, though, for many, I guess it would be the eating out that would be the luxury. Anyway, for the past year or so, I kept hearing rumors of an American-style restaurant with “the best hamburgers in town”. It seemed rather far for us and, living within the 1st Ring, there are many restaurant choices nearby, so we just never made it out to Boston Grill, despite its growing reputation and, I know now, its having been open about two years. So the time flies. You are young and then you die. Finally, today, we got in a taxi and went to track it down. For a large proportion of you, it’s probably in your neighborhood, so I don’t really mean to make it sound inconvenient. But Santa Cruz is just so titanic. The Ventura Mall is probably even more inconvenient for many of us. Boston Grill is an attractive place both inside and out, looking fresh and new and, well, pretty darned American. The kitchen is open to view and the view is mainly clean stainless steel shining back at you. There’s a big grill and you can tell it would be a fun place to cook. Though it was late for lunch, there were still quite a few customers. We found a comfortable table and I started looking around. And immediately panicked! I was maybe going to eat a hamburger and fries, but I had left my Heinz ketchup at home (Hunts will also do), and what I saw on the counter was the dreaded Kris ketchup, the scourge of Bolivian restaurants and households everywhere. I said something about it to my wife. I must have been looking around and jerking as if I was about to get up from the table and leave, because I noticed that my wife had quickly called our waiter over and was saying something to him that I couldn’t make out in my ketchupless-crazed state. I had come all this way, it was already late, I was hungry, and I was going to have to go find somewhere else for lunch despite being so curing about Boston Grill. I know, I know. It sounds crazy, but I swear it is not. That’s just the kind of thing that happens to you if you truly have taste buds. I am one of those, I’m afraid, so cursed. So, immediately the owner appeared. Franz. He could tell that I was a little perturbed. I raised my arm and pointed a shaking finger at the dreaded Kris and managed to spit out, “Kris! Kris!” as if I were pointed at the most hideous thing that ever came out of a UFO. I think I might even have started talking about how any self-respecting “American-style” restaurant would have to have a better ketchup, Dillman, at least. Franz asked me which ketchup I preferred. I told him. He told me he didn’t like Kris either, but no one had ever complained before. Then Franz said something that absolutely amazed me! He told me he was going to send someone out to buy American ketchup right then, so I could have it with my food. What? Not that famous Santa Cruz blank stare you usually get when you have a problem with a merchant, but actual, real service? He even apologized! This had to be a joke! So we stayed and I am so happy that we did! First of all, as he prepared our meals, Franz kept coming out to talk to us, so we got to know him a little. He and his wife are from Cochabamba, which my wife tells me is famous for good cooking, but he lived in Maryland, near Washington, DC, for 30 years. That might explain his good English as well as the “American-style” in his restaurant, I shrewdly thought. Franz had mentioned that I might like his special BBQ sauce, so, though I was determined to try a hamburger, I decided to also order the BBQ chicken breast, just so I could try it. Marci ordered the pacú, a local fish. The whole fish, which we had a chance to see was very fresh. And, yes, by the time our food was promptly served, amazingly, the Heinz ketchup had arrived—an entire case of it, not just one bottle. Franz says he’ll always have it from now on. That’s what kind of guy he is. Let me say now that one of the things I liked best about Boston Grill was that, though it has an American accent as far as the looks, menu, and service go, this is combined with a definite Bolivian slant. Prices and servings, for instance, are very fair. My hamburger with fries was just 18 bs. 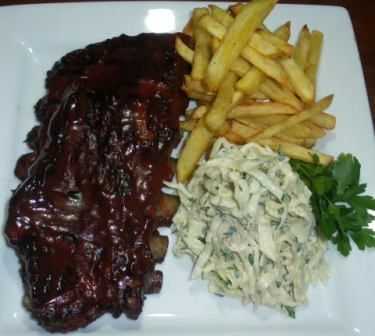 Dishes are quickly served because most of the items come directly and freshly from Franz’s grill. 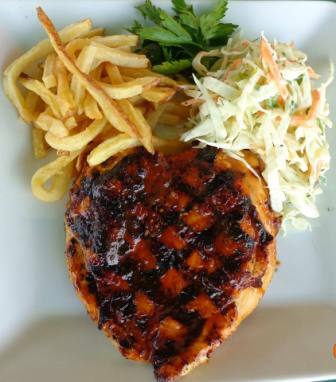 I meant to sample the BBQ chicken and eat the hamburger, but, even though the hamburger was one of the best I’ve ever enjoyed in Bolivia, I ended up devouring all the chicken, leaving room for less than all the hamburger. The BBQ sauce is simply incredible! One of the best I’ve ever had. And another little thing Franz does for his hamburgers is to make his own pickles and relish! Marci’s fish was perhaps even better than anything I had and some of the very best I’ve had in South America. This man has many secrets and maybe one is that he marinates things, maybe including the fish. It was just as light and crispy, yet tender as it could be. Great! My coleslaw was as good as my Mom used to make. 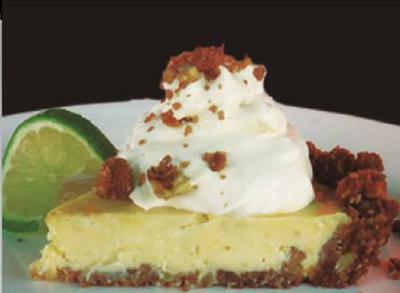 You won’t believe what we had for dessert—real key lime pie! One of my favorites and the result, I think, of some time Franz spent in Key West. The crust had more than one crushed whole grain, some pecans I think, with whipped cream and some more nuts on top. I know you’re getting tired of all these superlatives, but this was as good a dessert as I can imagine and, believe me, I have a very active imagination! 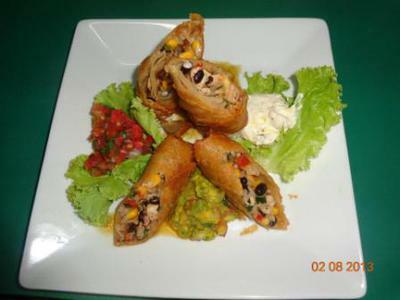 The menu includes other American and local dishes. There are nachos, New York strip, pork chops, salads, and an incredible looking BBQ ribs that will probably be my next order and maybe Marci’s too, though she says she doesn’t see how she is ever going to be capable of ordering anything other than the delicious fish she had, over and over, for the rest of her life. For local tastes there are other chicken and lomito items on the menu. The menu is not long and complicated. Franz sticks to what he can do fresh and do well, but there is more than enough variety to please even picky eaters like me. As usual, let me state that I don’t own Boston Grill. I never met Franz until today and still don’t know him nearly well enough to lie for him, even if he were paying me, which he is most assuredly is not. I have to admit, though, that I have a vested interest in seeing Boston Grill prosper for the selfish reason of wanting to continue to eat there, but I have an equally strong desire to share my good fortune and discovery with my friends and acquaintances so they can enjoy the same pleasures. And I hope you will.